There are 14 Assisted Living Facilities in the Peoria area, with 10 in Peoria and 4 nearby. The average cost of assisted living in Peoria is $3,103 per month. This is lower than the national median of $3,346. Cheaper nearby regions include Pekin with an average starting cost of $3,100. To help you with your search, browse the 53 reviews below for assisted living facilities in Peoria. On average, consumers rate assisted living in Peoria 4.4 out of 5 stars. Better rated regions include East Peoria with an average rating of 4.4 out of 5 stars. Caring.com has helped 8 families in Peoria find high-quality senior care. To speak with one of our Family Advisors about assisted living options and costs in Peoria, call (855) 863-8283. Located on the Illinois River, Peoria, Ill., has scenic views and arts and culture that residents age 65 and over — 14 percent of the population can enjoy with family and friends. Seniors who find some activities of daily living challenging to complete on their own will find 21 assisted living facilities in Peoria area to provide assistance with tasks like grooming, house cleaning and medication management. Facilities in Peoria and all of Illinois are regulated by the Illinois Department of Public Health. Located in the heart of Illinois, along the Illinois River, Peoria is known for its hot, humid summers and cold, snowy winters. The average high temperature in January is 33 degrees and 86 degrees in July. Peoria is home to the Central Illinois Agency on Aging, which provides a number of services for residents age 60 and older, including meals on wheels, exercise programs and senior bus transportation. There are also two senior centers within the city limits. Crime, particularly theft and property crime, is a continuing problem in Peoria. The crime rate in Peoria is 62 percent higher than the national average and is safer than just 7 percent of U.S. cities. The Peoria area is home to world-class medical facilities, including Kindred Hospital and Unity Point Health Methodist, in the event of medical emergencies or illness. It's not difficult to travel around Peoria. The city is intersected by three interstate highways — I-74, I-474 and I-155. In addition, the Greater Peoria Mass Transit District provides regular, scheduled public bus service throughout Peoria and between the city and other points in the county. Peoria is home to a number of cultural sites and museums. Chief among these are the Peoria Riverfront Museum and Planetarium, Luthy Botanical Garden, the Peoria Historical Society and Fort Creve Coeur, the first fort built by European settlers in Illinois. Assisted Living costs in Peoria start around $3,103 per month on average, while the nationwide average cost of assisted living is $4,000 per month, according to the latest figures from Genworth’s Cost of Care Survey. It’s important to note that assisted living rates in Peoria and the surrounding suburbs can vary widely based on factors such as location, the level of care needed, apartment size and the types of amenities offered at each community. Residents of Peoria will find a number of state and federal assistance programs to help them with the cost of assisted living. 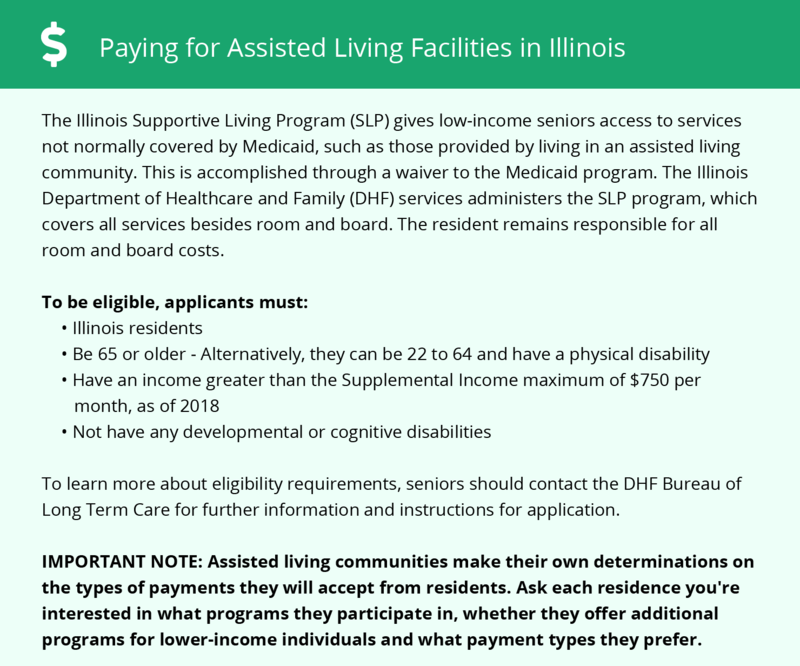 These include Choices for Care, the Illinois Supportive Living Program and Supplemental Security Income Category G.
Peoria and the surrounding area are home to numerous government agencies and non-profit organizations offering help for seniors searching for or currently residing in an assisted living community. These organizations can also provide assistance in a number of other eldercare services such as geriatric care management, elder law advice, estate planning, finding home care and health and wellness programs. To see a list of free assisted living resources in Peoria, please visit our Assisted Living in Illinois page. Peoria-area assisted living communities must adhere to the comprehensive set of state laws and regulations that all assisted living communities in Illinois are required to follow. Visit our Assisted Living in Illinois page for more information about these laws.